It’s important to understand your body type as the size and shape of your body will not only influence the way you train but also your diet and the potential for recovery and overall advancements in building muscle and strength. Next time you step into the gym take some time to have a look around. Pay close attention to the various body shapes of people working out. I don’t mean check and see if they are jacked or not – there’s more to it. You see there are a few different body types that are intrinsic to our physiology – we can’t really change this. Some of us are born into a slimmer, leaner build – while others have a thick and stocky shape. Take the example of Frank Zane and Arnold Schwarzenegger. Both are respectfully jacked beyond anything you see today, but they have a different shape. Go ahead, take a quick google and you will see both were world bodybuilding champions – and at similar times in the development of bodybuilding. Yet, each of them has a different build. Zane has a super lean physique and does not focus on mass, while Arnold was all about the size and shape ‒ not overly concerned with his cut as much. Truthfully, they both looked amazing, which is why they were both world champions. Where am I going with this? It’s important to understand that both of these world-class bodybuilders were jacked, yet they had different training regimens. The size and shape of your body will not only influence the way you train but also your diet and the potential for recovery and overall advancements in strength. Arnold Vs. Zane: What Are The Different Body Types? There are three main body types you will see in modern human ‒ this is ectomorph, mesomorph and endomorph. Quick to be athletes in younger years, an ectomorph has a traditionally smaller frame, leaner muscle mass and is sometimes categorized as skinny. This by no means represents a lack of strength – ectomorphs have a great ability for relative strength and can excel in gymnastics, swimming and long-distance running. Your ideal situation if you’re into bodybuilding is to be blessed with a mesomorph body. This body type is characterized by a strong and lean physique, generally taller than average and has an easy time growing into a larger frame. These are your natural athletes ‒ Frank Zane would fall into this category. The big boys. This body type is quick to go through a growth spurt and are generally filled with higher stores of growth hormone – which can be why they accumulate more fat than the average person. Endomorphs are sometimes said to be on the “fat” side of fitness, yet if you’re into powerlifting this is a perfect body type. The dense muscle tissue develops quickly and if you’re smart about it, weight loss is never that tricky. I don’t fit into any of those categories, is there a middle ground? These body types are not an exact science, so yes, it is completely possible that you fit into a middle ground. 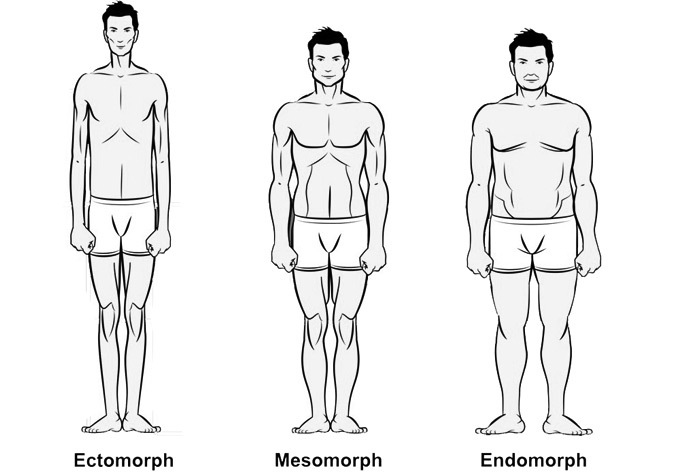 I myself have been categorized by my previous coaches as being between mesomorph and endomorph. Here is a simple way to determine which body type you are. If you fall under more than 3 boxes on a particular body type ‒ you have a match. As we said, this is not an exact science, and in some cases you may fall into two categories. For example, my waist is rather small, but my shoulders are quite wide – which throws off my proportions, but this is important to note in your training. The most important aspect to consider when you are looking at your personal body type is not the specific category, but each characteristic that goes with it. Just because you’re an endomorph doesn’t mean you can only powerlift. There are numerous styles of training you can use to optimize your lifts, but your training should still be rather specific to your ultimate goal and that body you have to work with. The last important aspect to consider is nutrition. We know that nutrition has a major effect on our overall body composition, but what about performance? 100%, your body type should influence the way you eat – especially when the performance comes into play. As a general rule of thumb, if your goal is to lose weight you can always implement a low-fat, caloric restriction. Chances are, if you’re reading this you already know how to lose weight and are looking for specific breakdowns to help you pack on muscle through nutrition. Let’s assume you checked off 3 characteristics on the list above and found your body type. Here is how you can improve performance, strength and overall body composition with your diet. From the perspective of physiology you have a small and thin frame because your metabolism is faster than other people. This faster metabolism is the reason you should eat a diet that focuses on carbohydrates as a staple nutrient. Your diet will focus primarily on starches and fibrous plant carbohydrates in order to have a constant supply of energy throughout the day. Since your metabolism is fast if you want to put on weight you’ll need to increase your meal frequency to 5-7 meals a day. NOTE: Keep your fat intakes low, and do your best to consume only unsaturated fats and lean protein sources for great amino acids. Mesomorphs have the easiest time when they are looking to diet for performance and strength. Your focus here should be to balance all your macronutrients and source whole-foods whenever possible. Your carbohydrate metabolism will still be high, and this is your staple nutrient in your diet. The higher demand for strength and muscle mass means you will need to have higher fat intakes. Your body will not allow for muscle to develop unless fat is present – namely the ketone energy found in fat sources. With that in mind, keeping your fat intake to around 25% of your intake will ensure you stay lean and strong. Protein intake plays a more important role than anything else as a diverse spectrum of amino acids are essential to maintaining the muscle mass without increasing the amount of fat you ingest. One of the main reason why you find it difficult to lose weight is because your body does a bad job of processing carbohydrates. In some cases the metabolised sugar from carbs is stored as fat ‒ which is why you have trouble losing weight. For this reason many endomorphs may benefit far more from a diet higher in fat and protein than carbohydrates. Above your macronutrient splits, it is completely essential that you take note of your meal timing. You will want to eat your carb-rich meals either 1hr before or 1hr after a workout ‒ this will help to insure that you don’t store as much of the sugar and instead utilize it as fuel for your training sessions. Diet and nutrition is ever important when you are trying to lose weight and build muscle, but what about when you actually get to the gym ‒ how do you train? Everyone that steps into the gym should have a specific goal they are trying to meet and train according to that goal. Unfortunately, if you don’t take your body type into account you could have a goal that is not quite attainable. Training with the strengths of each body type is important in developing a strong and defined body. A long and slim physique is not the worst thing. It will always be easy for you to lose weight and since you metabolise carbohydrates at a rapid rate you can train at higher intensities with great benefits. Train with HIIT style principles – long extended sets are great for increasing strength. Go crazy on cardio training. Your metabolism is fast enough. Train at higher rep ranges, 8-12 reps/set is perfect. Use excessively heavy weights and low reps – this is an easy way to get injured. The best way to train as an ectomorph is with a variety of exercise modalities. You should incorporate moderate cardio, high amounts of calisthenics and a small amount of resistance training in order to develop a base layer of strength. The gifted ones when it comes to weight lifting. Anything you touch will help you to put on muscle, although there is some important do’s and don’ts when it comes to training as a mesomorph. Train with high weight and low reps – traditional powerlifting styles will accelerate raw strength. Use high rest times. Keep your rest times to under 90 seconds. Lots of cardio – cardio will help you to starve off development of fat. Try to hit at least 120 minutes of cardio weekly. Get fixated on isolation exercises. You will benefit more from bigger, compound lifts. Mesomorphs have some of the widest variation in their training regime but as long as you keep your cardio high, rest times low and focus on compounds lifts you will pack on muscle. Much of the training you see powerlifters follow are perfect for the endomorphs. Of course compound exercises are prefered by much of the weightlifting community, but don’t shy away from isolation exercises as they can be great for finding balance in training. Focus on big, compound lifts like squat, bench, overhead press and deadlift. Sit around on rest days. Your metabolism is slow, so you’ll need to stay active unless you want to put on weight. Cardio with every workout. Especially if you are trying to rid your body of high fat stores you need to have an excess of 180 minutes of cardio weekly. Forget about mobility. Especially with a program built around strength, range of motion becomes crucial in stimulation of hypertrophy. This is one of the main aspects of modern training that so many people are missing. With a host of online workouts and endless training platforms far too many people go to the gym with no intention of training specific to their own physiology. If you have a smaller build you need to train and eat in order to put on weight. Just as a larger build will benefit from lower reps and higher weights, a smaller build may benefit from the opposite. The main aspect to always keep in mind is that your diet and training is intentional and specific. You time your meals, structure your macronutrients and workout according to the body you have been given and the goals you have in mind. Take advantage of the strengths of each body type. Each have benefits and downfalls, and no one body type is best ‒ only by understanding your body will you learn to grow and develop your best physique. What Is Tempo Training, and How Can It Improve Your Strength & Muscle Gains?